Our all new heavy-duty pneumatic tire lift truck. Beyond its heavy-duty carriage and robust mast, you’ll find that virtually every system on the new PD6 is designed to deliver maximum uptime no matter how difficult the environment or the challenge. From proven technology to innovative features, the PD6 brings you a higher level of servicing ease, extended component life, and greater protection to critical components. It’s reliability you can count on — and profit from. With a Kubota engine that provides power while reducing fuel consumption. The turbocharger creates more power by compressing inlet air and forcing it into the chmaber, which boosts occurs over the entire rpm range for more torque and even low speeds. The PD6 high capacity forklift has a switch that changes the shift speed pattern of the transmissionthat allows the operator to select the best mode for the work conditions. Low, medium, and high mode are determined based on slopes, heavy loads, and longer trips. The PD6 high capacity forklift has a meter panel that provides constant status on critical systems. Fuel and coolant temperatures, hour meter, error codes, oil pressure, air cleaner, battery charge — all of this from the LED meter panel. Information at a glance! The PD6 series has a super-wide carriage that provides operators with excellent forward and fork tip visibility for greater security and enhanced productivity. The operator also has generous headroom space and plenty of foot and legroom. Automotive type controls and a small diameter steering wheel reduce fatigue and boost confidence. What application do I use the PD6 series in ? 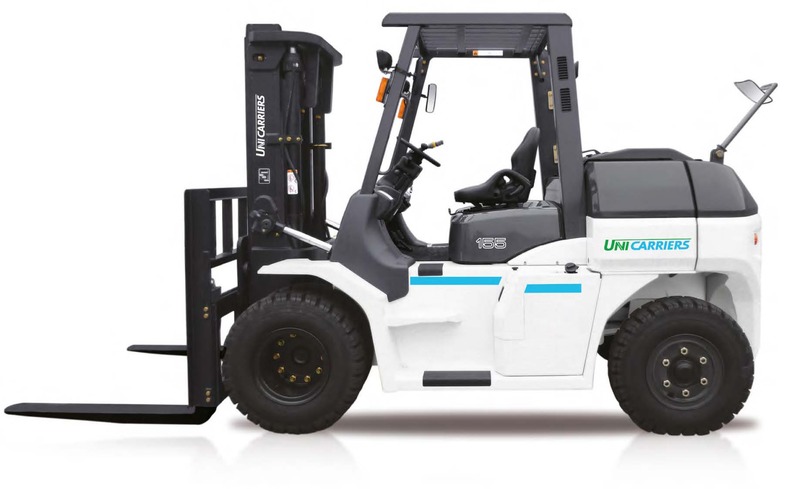 UniCarriers PD6 series high capacity forklifts have all the necessities for the toughest applications. From a floating powertain for less vibrations to a full suspension seat with recline features, the PD6 lets the operators ride in comfort on long shifts to get the job done. The PD6 series high capacity forklift can handle the elements when in harsh environments. Feautring an electronic glow system for cold weather starting to a electronic two-speed transmission, power transfers efficiently and allows operators to work in virtually any type of conditions.